This short connector trail will take you from the Second Water Trail to the Second Water Spring and the site of the Obie Stoker mining camp. This historic trail might be useful for backpackers needing to tank up at Second Water Spring as the only other way to get there is by scrambling 1/3 mile up Second Water Canyon (an arduous task with a full pack). This trail was established more than 50 years ago as a route in and out of the Obie Stoker mining claim and camp. Mr. Stoker was an interesting gentleman who mined for gold in Second Water Canyon for almost 50 years from the 1930's until the 1980's. There's a short writeup on the Obie Stoker and his mining claims in the Superstition Wilderness Trails West hiking guide by Jack Carlson (see the "Second Water Spring" hike). The Stoker Trail is referenced in that writeup and noted on the map. Obie Stoker is also referenced in the Tom Kollenborn Chronicles written by one of the leading experts on the Lost Dutchman Gold Mine legend. This trail requires some route finding and a GPS. The trickiest part is finding the cutoff from Second Water Trail as it is not cairned or obvious. GPS is highly recommended to find the cutoff but, once you find it, the trail is fairly well marked with cairns that have probably been there for 50 years or more. It is an easy 1/3 mile to the camp and spring. At the end of this 1/3 mile connector trail you will find the headwaters of Second Water Spring. As of early 2018, the source of the spring was a small, 3 foot diameter clear pool with a depth of 4" or so. Down canyon from the pool are about a dozen other pools of varying clarity, some rather deep. As is always the case with springs in the Supes, you should reconfirm the existence of all water sources before you rely on them. Even the most reliable springs can have dry periods. Note that there's some confusion about the location of Second Water Spring. Some people refer to the water source that crosses the Second Water Trail (1/4 mile west of the Boulder Canyon Trail) as Second Water Spring. 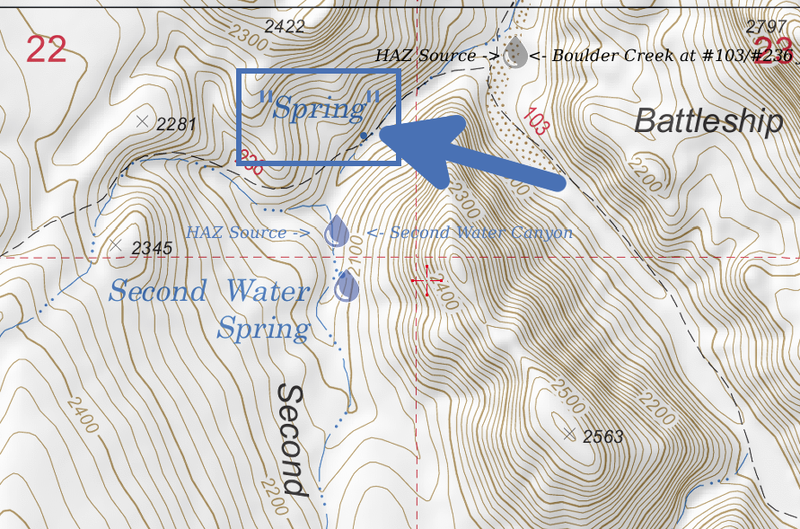 Reviewing the old USGS topos reveals that spring as a separate water source from the true Second Water Spring which is about 1/3 mile up canyon from that point. The USGS just labels the one that crosses the trail one as "Spring", so some folks refer to it as "Unnamed Spring." Within the HikeArizona Water Reports section, the spring that crosses Second Water Trail is labeled as Second Water Canyon while the true spring, 1/3 mile up canyon, is labeled Second Water Spring. The former Obie Stoker camp is just up the hill from the spring. It has a little bit of shade (OK, not much) and some flat areas for tents. Plus, there's some old rusty artifacts from the gold mining era. Reportedly, there were two mining tunnels up in the mountainside from there. See the Carlson book for details.